Running in Wichita, Kansas. 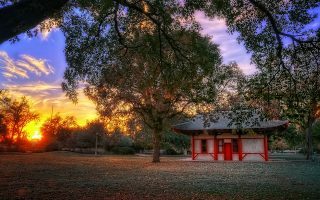 Best routes and places to run in Wichita. 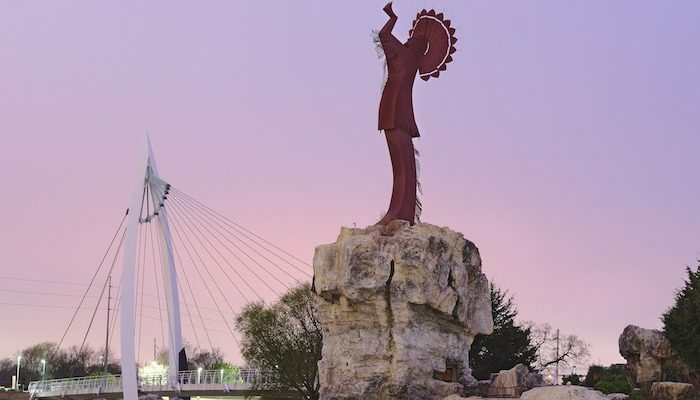 From its perch on the banks of the Arkansas River, Wichita is the largest city in Kansas. This Kiowa territory became known as a “Cowtown” along the Chisholm Trail, then entered the modern age as a hub for aeronautics. Today, the city is a hotspot for manufacturing and healthcare businesses, and a destination for music-lovers, museum-goers, and sightseers. 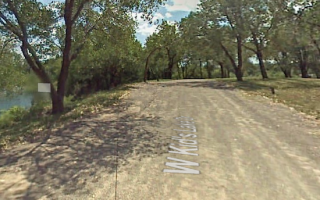 There is a good variety of running in Wichita, from lovely river paths to parks and extensive multi-use trails. Getting around the flat streets of Wichita is pretty easy. Most travelers choose to drive, but the small city offers other public transportation, including a cheap (but somewhat limited) bus system, a bike share program, and a free downtown trolley. For travel outside of the downtown area, a car is recommended. Also, be prepared for winter weather that can be harsh and thunderstorm-prone summer afternoons. 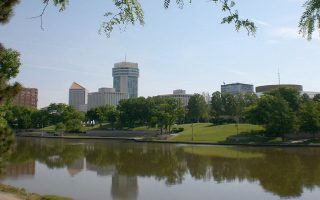 A wide, paved multi-use path stretches roughly 10 miles along the banks of the mighty Arkansas river through downtown Wichita. Many parks and water views. Paths on both sides of the river for a 3 mile section. 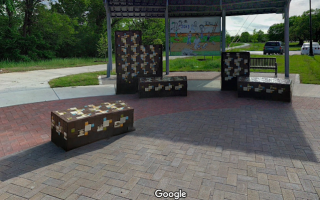 This large park in northwest Wichita includes four lakes, field and forestland, and 4+ miles of paved bike paths popular for running. Perimeter path of 4 miles and some nice interior paths. The 15-mile Prairie Sunset Trail is a nice spot for an out and back with scenic railroad tressels and covered bridges. Crushed gravel surface. 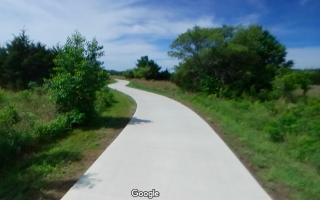 One of the better bike paths in the Wichita area, the K 96 Path starts in North Chisholm Creek Park near Wichita Airport and runs 8 miles to the Crestview Country Club. Nicest section is at northern end. 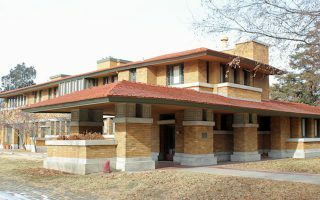 This neighborhood features pretty tree-lined sidewalks with lovely homes including the Frank Lloyd Wright Allen House. Create your own route or use our 3 mile loop as a guide. Riverside sits at the confluence of the Little Arkansas River and the Arkansas River. 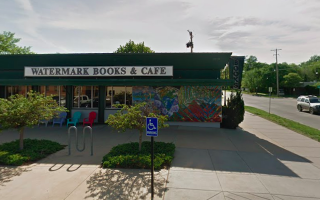 This route combines the Arkansas River Path with some great neighborhood and park running. Get your art fix with this tour of the 50+ murals that paint the Douglas Design District. Can be done as a 5 mile out and back, but there are lots of street crossings. 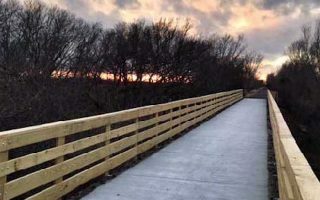 The park includes a 1.6 mile nature trail through wetlands and along the creek, a 1.3 mile loop around Chisholm Lake, and several other side trails leading back to the K 96 Trail. 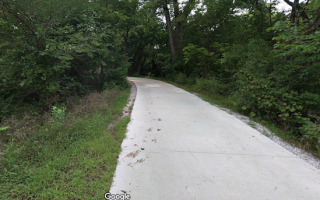 The most popular section of the 11.5 mile Red Bud Trail spans about 2.5 miles on a wide concrete path from I-135/Murdock to Wichita State University. We've mapped 5 miles overall. Wichita has hot summers and cold winters. Summer heat creeps well into the 80s and is humid. Keep an eye out for thunderstorms. 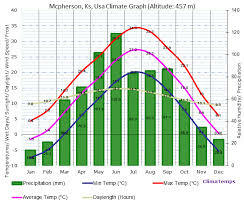 Winters are cold but not frigid, with daytime highs aound 40F (5C) and lows dipping into the 20sF. Winters tend to be drier, with summer rains typically coming through thunderstorms. The hottest spot to stay in Wichita is the Old Town area, where visitors will find several hotels. Otherwise, Wichita is quite small and driveable, so the hotels to the east or west of downtown are also good choices. There is a large cluster near the airport, and several other choices in the Eastborough and Route 96 areas. For more info on local hotels, check out the listings at VisitWichita.com. Fleet Feet Sports Wichita — with 2 east and west locations — offers frequent running groups and training programs. They were also extremely helpful with this guide! This calendar lists the group runs across all their stores. First Gear Running Co. hosts a Wednesday night Track Night at Cessna Stadium at 6:30. For other groups, check out Derby Running Club and Run Wichita. Check out Run Wichita’s Race Calendar for upcoming events. Fleet Feet also has a great local race calendar.